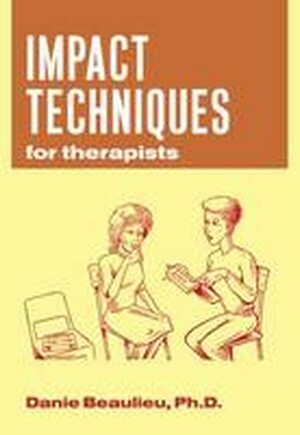 Impact Techniques for Therapists teaches the basic principles of Impact Therapy, first developed by Ed Jacobs in 1992. Drawing heavily on the work of Milton Erickson, this form of therapy uses a creative and interactive approach to counseling that involves all senses in the therapeutic process. These innovative, multisensory techniques will incorporate therapist-client exchanges on not only verbal but also visual and kinesthetic levels, thereby increasing the efficacy of the intervention. Accompanied by a conversational tone and vivid artwork, Beaulieu presents concrete examples of props and movements that can be introduced into therapy and thoroughly illustrates their different uses. Originally written and published in French as a handbook for therapists, Dr. Beaulieu's formative work is now available in a new English edition, with a more encompassing introduction as well as updated case examples. The model set forth in this book can be integrated easily and seamlessly into the practice of a wide variety of mental health professionals seeking to discover new and innovative developments in brief therapy. Preface. Introduction. Impact Techniques Using Objects and Props. Impact Techniques with Chairs. Impact Techniques Using Movements. Conclusion. References. Books by the Same Author. About the Author. Index.